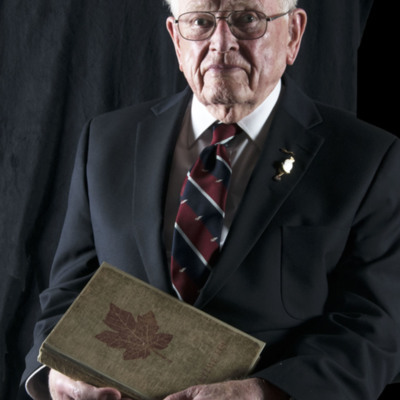 Reg Payne holding one of his paintings. Two Lancasters in flight. VN-B and KM-Y. 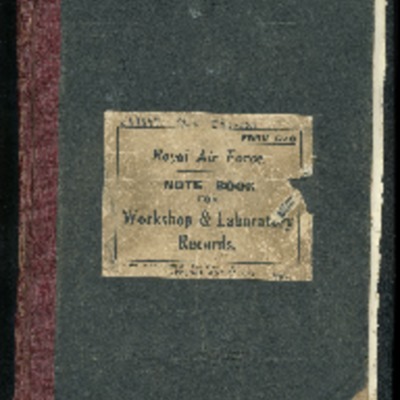 On the reverse 'Reg Payne 0220'. 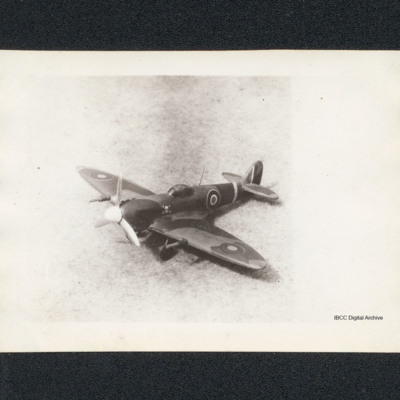 Model of Rob McClement's Halifax ZA-V mounted on a stand with an engraved plaque. 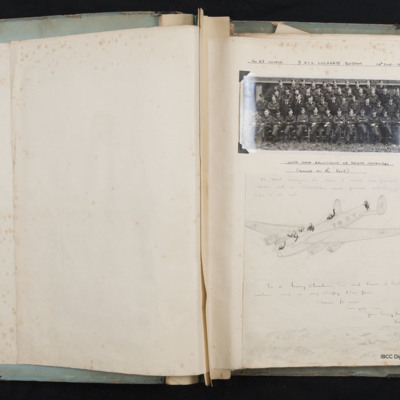 Under the base of the Halifax model is an inscription 'Made for R. McClements by German P.O.W. at Melbourne'. Model of an IL-2 Sturmovik with Russian markings. 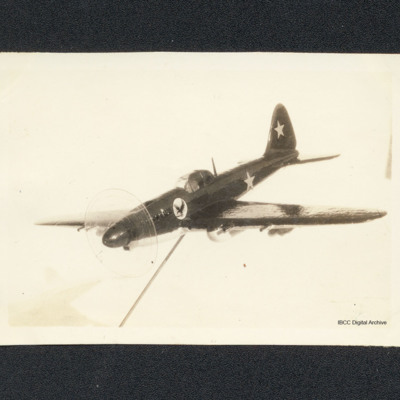 On the reverse '20/7/44 Stormovik IL-2, Top speed 280 MPH, 2 x 32 mm cannon, 4 m/guns, 4 x 250 lb bombs'. 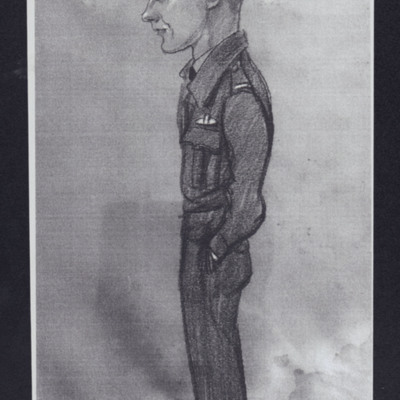 A caricature side view of Ron Mathers standing looking at Lancasters. 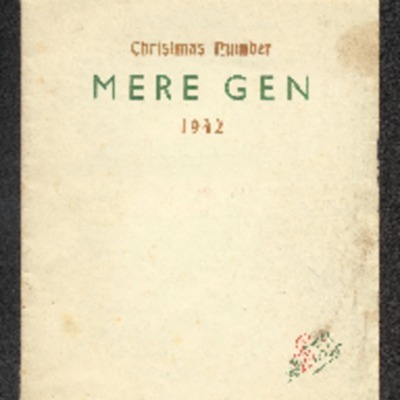 It is signed by Pat Rooney and dated 1945. 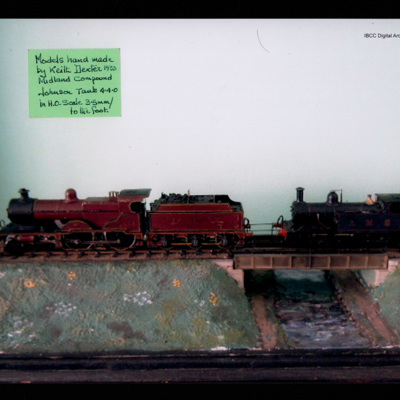 Two model trains on track on bridge over stream. Note 'Models hand made by Keith Dexter 1933, Midland Compund Johnson Tank 4-4-0 in H.O. scale 3.5 mm/to the foot'. 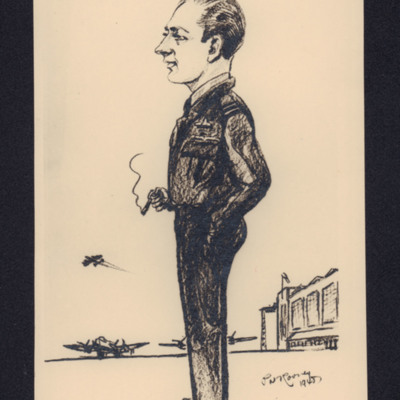 A side view cartoon of Harold Gorton. 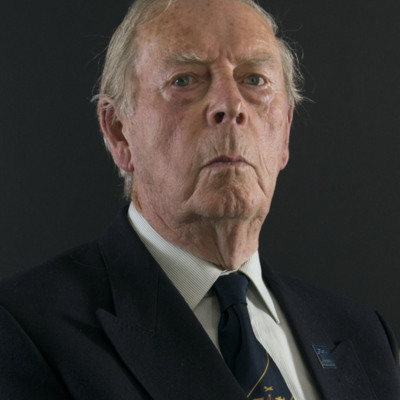 He is standing with his hands in his pockets. 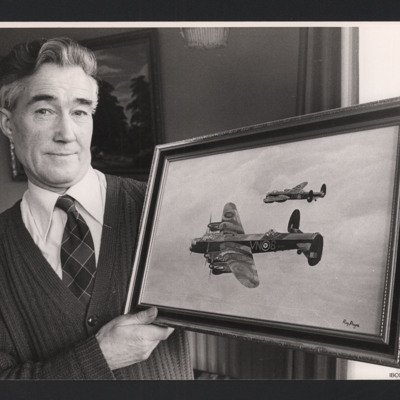 It is captioned 'Gort' and is signed 'Pat Rooney 1943'. 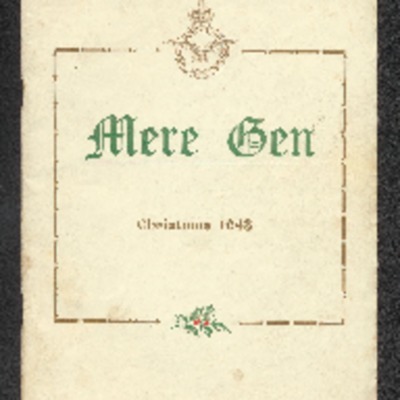 A booklet of war time cartoons. 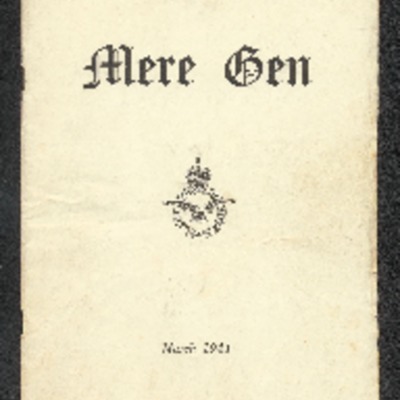 The second page contains names, addresses and signatures of colleagues. Envelope and card addressed to Ernie Twells, inviting him to the wedding of Beatrice Marshall and Arthur Brittain. 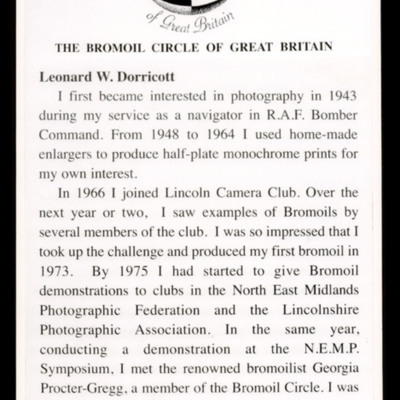 A document written by Leonard W Dorricott describing his interest in Bromoil photography. 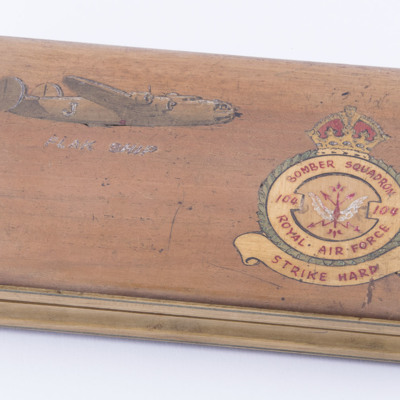 A small wooden box with a 104 Squadron crest, an image of a B-24 and the text 'Flak Ship'. 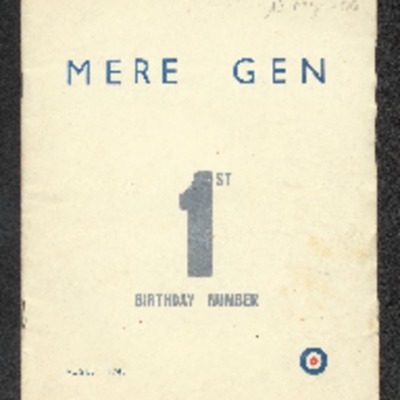 Inside is a typed piece of paper with '1215793 F/Sgt Norton'. 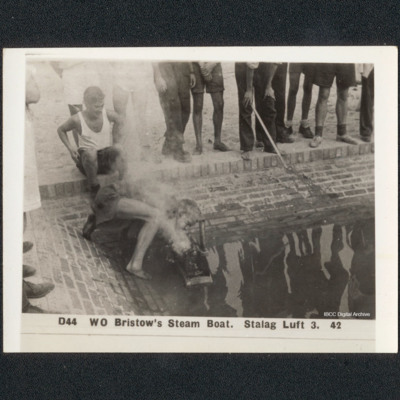 The steam boat is running across the pond. Its progress is watched by seated and standing spectators. 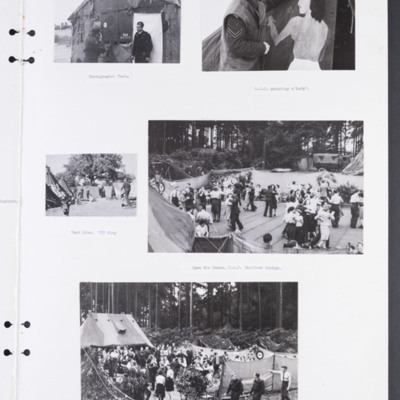 In the background is a hut. One yacht is on the water and one is at the side. 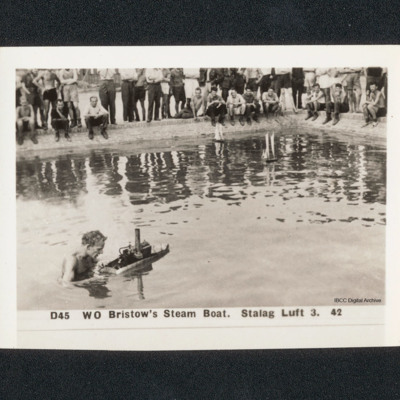 Bristow up to his chest in water performs maintenance on his steam boat. Around the pond are many seated and standing spectators. There are two model yachts on the pond. 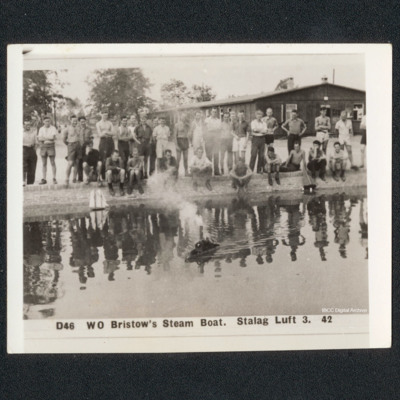 Bristow and boat are in the corner of the pond. A small group of spectators is watching.